The project I’m sharing with you, exceeded all our expectations when planning this. I had this faucet in my repurposing stash from our home remodel; it used to belong to the laundry room facilities. My husband gave it to me because he knew I would want to keep it for repurposing, smart man! 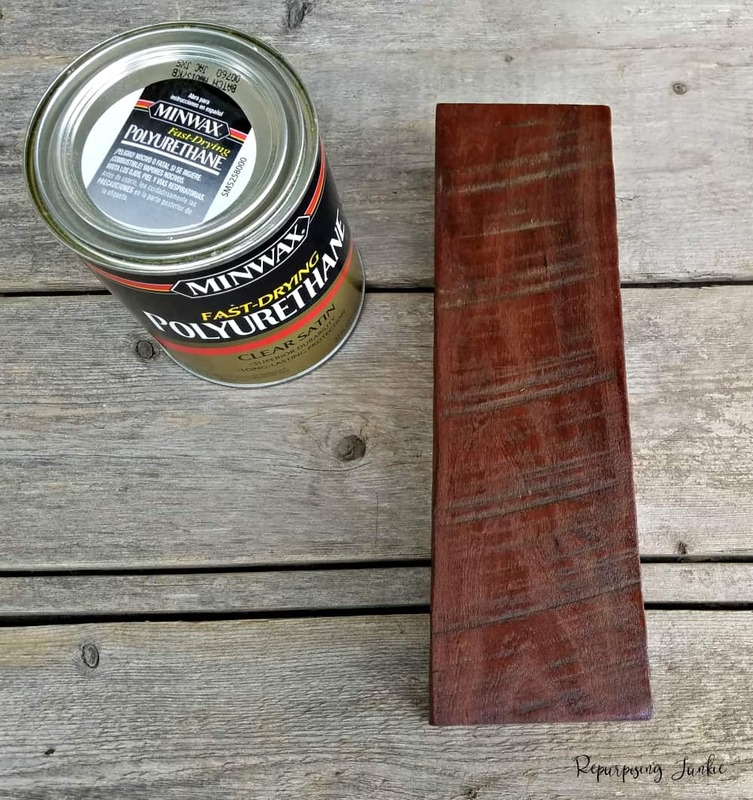 Well I pulled it out thinking it would make a great hand towel holder paired with an old 2×4, and decided to write this post on How to Make a Towel Holder with an Old Faucet. The old 2×4 was cut to length, and then I sanded it and put a coat of polyurethane on it to seal it. We actually have a few 2x4s that came from remodeling this old house we bought. These old boards are incredibly solid from age and those saw marks are just too cool to sand away. The faucet got an incredible makeover. I started cleaning it up and sanding some of the corrosion and grime off of it. My husband graciously took over getting the corrosive elements removed. He got most of the patina off with his grinder, and then took the Dremel to the crevices that he couldn’t reach with the grinder. Then he buffed it with the Dremel. I was wow wow wowed by the end result. I mean how amazing is the new look?!! Now some of you may like the old look better, but look at what was underneath, you can’t contest that the faucet cleans up pretty good, right?! It’s ok, you can let out a whistle at this beauty. Would you even believe that was the same spigot? I love when I have an idea and I can take the idea to my husband and he says, “Yep, I know how to make it work.” That was the case with this faucet. I was waving it around asking him how to make it into a towel holder by mounting it onto a 2×4 and he knew the logistics of it. So here is his plan in action. 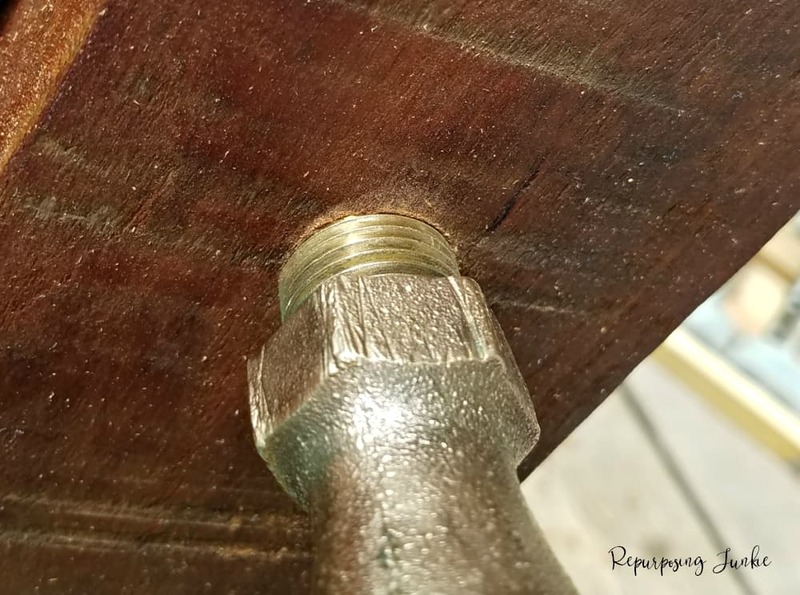 He used a Forstner bit to drill a hole in the 2×4 that was just big enough to start the thread of the faucet into the 2×4. 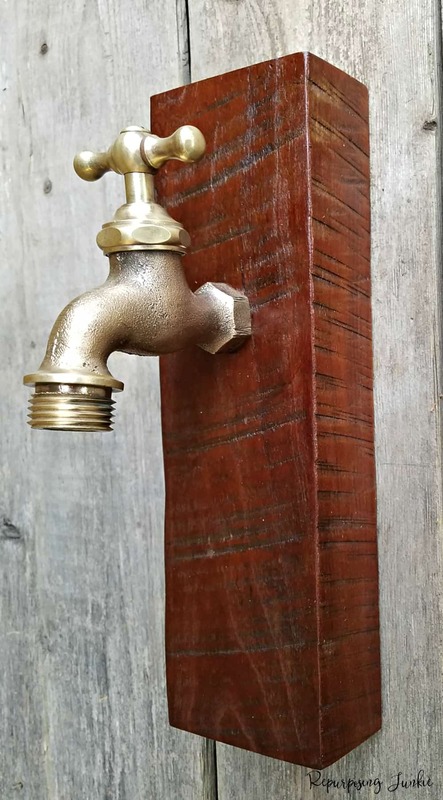 He put the beginning thread of the faucet into the 2×4 and at first twisted it into the wood using his hands. Then he employed the help of a crescent wrench to tighten it in there. After he had the faucet mounted, the wood got wiped down and another light coat of polyurethane was brushed on. And here’s the end result. Kinda gorgeous right?!!! The color of the wood is such a beautiful combo with that gold color of the faucet. So what do you think? Have you ever had a good idea that exceeded your expectations? Don’t you just love that!! 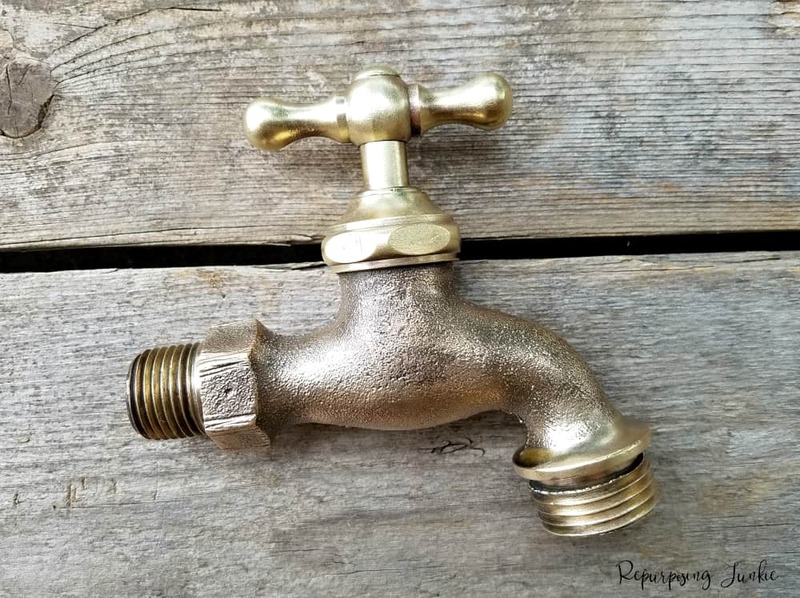 I would love it if you would share this project on How to Make a Towel Holder with an Old Faucet! You would never in a million years say that’s the same faucet, wow Keri, she sure does clean up nicely and you’re right about how awesome she looks mounted on the old piece of plank. Such a great idea and it looks sooooo cool. Wow!! That faucet did clean up nice!! Very cool!! WOW!! Can you see my jaw on the floor? And when I glanced at it before reading the text I thought you had buffed it with something. I am super duper impressed here. Such beauty hiding underneath all the dust and patina. That is gorgeous! And so cute for a towel holder! Love the richness of that wood stain too! Oh wow Keri, what a unique piece! It looks really different and I like your idea of using it as a hand towel holder, I bet it looks so cool in your bathroom or kitchen? I also really love the contrast between the gold and wood, and yes, I definitely love those “wow” moments when everything just works out amazingly! What a novel idea. I just love unique and one of a kind items for the home.